Diffuse knapweed is a biennial, short-lived perennial or sometimes annual plant. It grows about 2 feet tall from a single branched stem. Rosette leaves are about 6 inches long and thinly divided, whereas upper stem leaves are smaller and smooth-edged. The stem is rough to the touch. Each branch produces a single flowerhead at the tips. The flowers vary from white to pinkish. Bracts on the flowerheads bear small, yellowish spines with small teeth-like projections along the sides. The seeds are brown to grey and tipped with a light-colored plume that drops off as the seed ripens. Grazing Objective: Graze heavily at least twice each year to prevent flowering and for three or more years to reduce populations. Growth Stage for Treatment: For sheep, it is best to graze diffuse knapweed in the rosette or bolted stages. Goats will graze all growth stages. Palatability for cattle quickly declines beyond the bolting stage. A minimum of two grazing treatments per year is necessary to prevent seed formation, and a minimum of three years is required to reduce populations. Potential Effectiveness: Diffuse knapweed is readily grazed by sheep, goats, and cattle up through the early vegetative stages. Palatability is reduced as the plant ages especially for sheep and cattle. Diffuse knapweed is not as palatable as spotted knapweed. Targetedgrazing grazing can reduce plant vigor, size, and flower production. Long-term control depends on the prevention of flower and seed production. Grazing must be applied at least twice per year over several years to be effective. Remove livestock for approximately two weeks and regraze to prevent seed head formation. Grazing is most effective when combined with herbicide treatments. Beck, K.G. 2000. Diffuse and spotted knapweed. Colorado State University Cooperative Extension. Fact Sheet No. 3.110. 2 p.
Roche, B.F. and C.T. Roche. 1999. Diffuse knapweed. In: R.L. Sheley and J.K. Petroff [EDS.]. 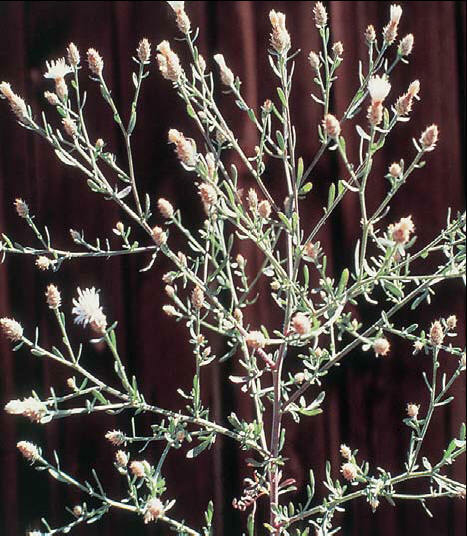 Biology and management of noxious rangeland weeds. Corvallis, OR: Oregon State University Press. p 217-230. Sheley, R.L., J.S. Jacobs, and M.F. Carpinelli. 1998. Symposium – Distribution, biology, and management of diffuse knapweed (Centaurea diffusa) and spotted knapweed (Centaurea maculosa). Weed Technology 12:353-362.